"There are thousands of people here [at ISA Sign Expo]. I find a lot of value in the conference because I meet new vendors. I met a few at last year’s conference that I’ve been using all year long. So, there’s definitely a lot of value in being a member of ISA." 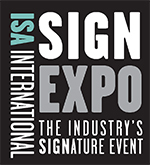 The International Sign Association offers the industry's best events to help businesses in the sign, graphics and visual communications industry to grow. From subcontractors to suppliers, attendees energize relationships and find industry-specific education through on-site, in-person events. With more than 20,000 attendees and nearly 600 exhibitors pushing the limits of innovation in wide format printing, digital signage, LEDs and software, you're sure to find the people and solutions to grow your business and become more profitable. What's the best way to get industry-specific information to solve problems for you and your whole team? ISA offers webinars throughout the year on topics relevant to the sign, graphics and visual communications industry. Webinars are offered for free as a benefit to ISA and ISA Affiliated Association members. Finding qualified workers is one of the biggest challenges facing the sign, graphics and visual communications industry. On Sign Manufacturing Day, companies in the sign, graphics and visual communications industry host facility tours to encourage CTE students to explore exciting and diverse career opportunities within the industry. The International Sign Association's Converge is the only industry networking conference exclusively for on-premise sign company suppliers, distributors and national sign companies. It’s the event where industry thought leaders come together to forecast future trends, find solutions to business challenges, discuss emerging technologies, learn from industry experts and network. Want to connect with your peers, hear valuable insights or explore innovative products? Check out a variety of ISA and the Affiliated Association's upcoming events or add them all to your calendar. Click the name of each event to learn more.